878 A.D. 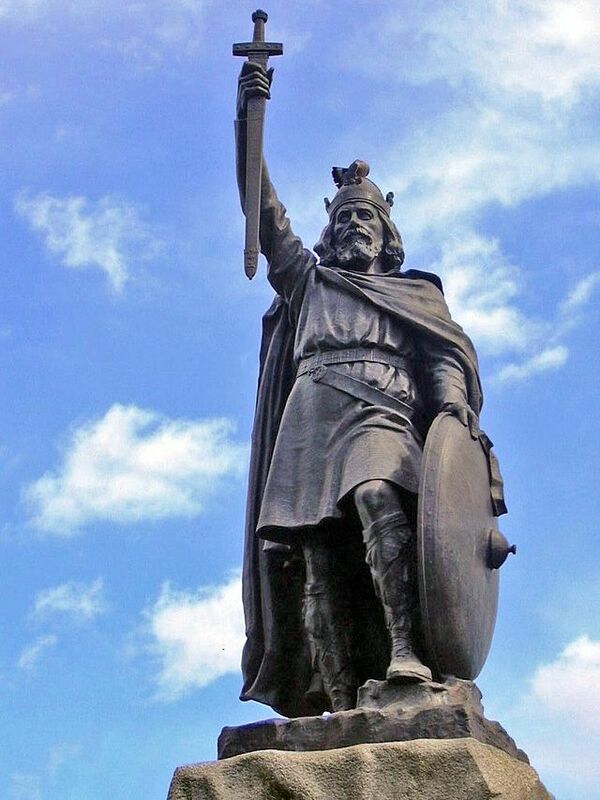 In the seventh week after Easter King Alfred rode to Ecbryht’s Stone…All those of Somerset came to meet him, and those of Wiltshire and Hampshire…they were glad of his coming. ..He went from that camp…to Edington, and there fought with the whole force and put them to flight… Then the force gave him hostages, and great oaths that they would go from his kingdom; they also promised that their king would receive baptism. For seven weeks now The Last Kingdom has been journeying toward the Battle of Edington, which is the climax of this season finale. But there is so much that happens before that battle! Those of us who have read Bernard Cornwell’s book The Pale Horseman have a general idea of what will occur, but because writer Stephen Butchard has been forced to re-work some characters and events, there are some surprises in this episode even for those who know the story. Change is in the air after the four difficult months in the marshes at Athelney. Alfred has been tested, and he comes out of this trial stronger and more determined, convinced that God is with him. He has come to a decision about what must be done to preserve his kingdom, and he turns for advice to Uhtred and Beocca. Some of my favorite moments in this episode occur when the camera is focused on Alfred as he listens to the men around him, because although Alfred’s determination has strengthened, in other ways he has softened. There is a warmth here that we did not see in the cool, level-headed king of the earlier episodes. One example of this occurs when Brother Asser warns Alfred against trusting Uhtred. He is a man without a soul, Asser says – echoing words that Alfred himself has spoken in a much earlier episode. But Fr. Beocca cries Then I will be his soul, lord! The ensuing dialogue, this argument over Uhtred’s soul, is fine writing, and Alfred’s expression as he listens conveys the change in his attitude toward Uhtred even though he says almost nothing. When Uhtred weeps over a terrible loss, the camera angle includes Alfred observing him from a distance. Later, when Alfred goes alone to Ecbryht’s Stone to search for a sign of the men he has summoned, it is Uhtred who follows him and hears him say, Not a single man has come. And it is Uhtred who encourages the king with, Then we must wait, lord. It is subtle, this bond, this mutual respect that has been formed in the marsh between the two men, but it is there. Alfred can be cold as well, as we witness in a scene set in Odda’s hall. He is stern and hard, even toward a grieving father. His mind is bent on saving his kingdom, and there is no forgiveness for treachery. As the armies prepare for battle Alfred gives a stirring speech to his men, and before it’s all over, this ailing, cerebral leader becomes Alfred, the warrior king. Uhtred has changed, too – no longer the hothead we saw in earlier episodes. Fearing (correctly) that Brother Asser might try to undermine his relationship with Alfred, Uhtred turns to Fr. Beocca and asks him to intercede. The brash adolescent who blundered armed into the king’s assembly at Winchester has matured. You are the man I’d always hoped you would become, Fr. Beocca will tell him. But the priest, like Uhtred, recognizes that Uhtred’s maturity has come at great cost. Even Æthelwold, Alfred’s nephew who believes he should be king, is given some moments of grace before, during and after the battle. It is difficult to know what, exactly, moves him to act as he does in one particular scene when he follows Alfred, clearly with a murderous intent that he, surprisingly, purposefully sets aside. This is a scene that was not pulled from the novel, and all in all Stephen Butchard leaves us with a more positive image of Æthelwold than Cornwell did. That being said, because we don’t know Æthelwold’s motivation, there is still plenty of opportunity for him to turn to the dark side should the show go into a second season. As for the battle, in my copy of the book it goes on for 36 pages. For the screen it has been trimmed down considerably. Nevertheless, filmed both from above and from the viewpoint of the men in the shield wall, it gives the watcher a feel for the horror of medieval war. I’ll leave it to others to describe it except to point out one thing: midway through, Uhtred, driven by rage, goes over the enemy shieldwall and is surrounded by Danes. This moment hearkens back to the first episode, when his father charged through the Danish line and found himself in the same position, surrounded by the enemy. But Uhtred’s father was part of an army that was divided, and despite his courage, the Saxons did not follow his lead. This time it’s different. This time the warriors follow Uhtred because they are fighting, united, under a single king: Alfred of Wessex. Erik Kain in Forbes.com recently wrote: The market is better than ever for Medieval drama, and there’s plenty of room for more great shows about knights and warriors, swords and sorceresses. I hope that BBC2 and BBCAmerica agree with that view and that The Last Kingdom, which has received nothing but wildly positive reviews as far as I can tell, will go into a second season. We want to see more of Uhtred of Bebbanburgh and of Alfred the king. This entry was posted in Anglo-Saxons, History, Review, The Last Kingdom, UK, Vikings and tagged Angl-Saxons, Battle, Book Review, King Alfred, Medieval, Review, TV Series, Uhtred, Vikings. Bookmark the permalink. All in all an enjoyable series which I am led to believe will be followed by another. Some easy criticisms exist, such as silly alterations, and the fact that most of the Danes seem to be wearing mascara, but that doesn’t take away from a solid adaptation of a great series of books. I’ve loved seeing Uhtred and Alfred’s complex relationship develop. It’s depiction has, in my opinion, been the triumph of the series. Hi John. Thank you for your comments. I agree that the complex relationship between Uhtred and Alfred was the triumph of the series. It seemed to me, as well, that in writing the script, Stephen Butchard chose to make that relationship even more central than it was in the books. Part of this was due of course to the fact that so much material had to be jettisoned, but I think there was a conscious effort as well to highlight their conflicts, and it was such a pleasure to see Alexander Dreymon’s hot-headed Uhtred face off against David Dawson’s cerebral King Alfred. You are correct that a second season will follow, and it will be interesting to see how closely Butchard’s scripts will follow Cornwell’s novels as Uhtred goes north. I’m so glad you’ve enjoyed the blog. I’ll be dealing with THE VIKINGS again in the spring. A very late reply, but it was recorded by Ahmad ibn Fadlan that Vikings did indeed wear eye makeup, both men and women. Hi Gina. I knew about Ibn Fadlan’s writings about the vikings, but hadn’t realized that he described the eye makeup. Thank you!